Dr. Martin Luther King Jr. is widely viewed as a national hero for racial equality and justice, and Americans honored his legacy with the unveiling of a national memorial in Washington in 2011. Since 1986, three years after President Ronald Reagan signed the bill into law, Americans have celebrated King’s legacy as a federal holiday on the third Monday of every year. 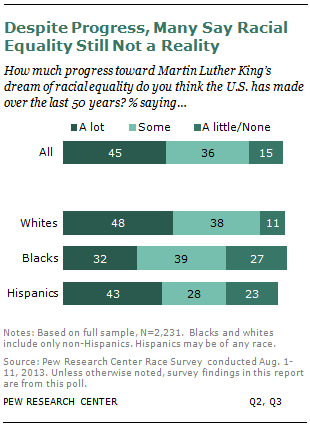 However, fewer than half (45%) of all Americans surveyed last year said they believe the U.S. has made substantial progress toward racial equality since 1963, when King delivered his “I Have a Dream” speech in Washington. Roughly half of Americans (49%) said “a lot more” needs to be done to achieve racial equality. Broken down by race, a higher share of blacks (79%) than Hispanics (48%) and whites (44%) felt that way, according to a Pew Research Center report. Economic gulfs have persisted between blacks and whites in the past few decades, according to our analysis. Blacks lagged behind whites in several measures, including both median household income and household wealth. In 2011, blacks were nearly three times as likely as whites to be living in poverty. Yet, there are several racial gaps that have narrowed between blacks and whites, such as at-birth life expectancy and rates for high school completion and voter turnout. According to the latest Census Bureau estimates, the share of eligible blacks who cast ballots had been rising since 1996 and stood at about 66% for 2012 elections. That share is higher than the share of eligible whites who voted (64%) for the first time since the Census Bureau offered those numbers.